This blog post of mine focuses on the three types of questions asked in GATE – it tries to give an in-depth analysis of the type of questions you actually face in GATE. If you want to have an over-all idea on the pattern of GATE exam, please visit my earlier blog article titled: GATE 2013 Exam Structure/Pattern/Format. 1.0 Individual questions: Each question either 1 mark or 2 marks. 2.0 Common Data Questions: Each question 2 marks. 3.0 Linked answer questions: Each question 2 marks. While you should not bother to learn too much about the Individual type questions (as you must have already come across them), you should take care to learn what are Common Data & Linked answer type questions. 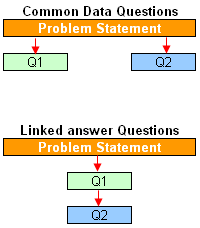 In these types of questions, one problem statement/passage is given, which is followed by two questions. Both of these questions are independent of each other and hence the answer of one question is not required to find the answer of the other question. (A) 83litres/sec (B) 67 liters/sec (C) 57 liters/sec (D) 53 liters/sec. These questions are very similar to Common Data Questions. One problem statement/passage is given, which is followed by two questions. But unlike Common Data Questions, in Linked answer questions, answer of one question is required to find the answer of the other question. Statement: A doubly reinforced rectangular concrete beam has a width of 300mm and an effective depth of 500mm. the beam is reinforced with 2200mm2 of steel in tension and 628mm2 of steel in compression. The effective cover for compression steel is 50mm. Assume that both tension and compression steel yield. The grades of concrete and steel used are M20 and Fe250 respectively. The stress lock parameters (rounded off to first two decimal places) for concrete shall be as per IS 456:200. Hope with above information of GATE Question type/Question Pattern you have got the required insight on the type of questions you are actually going to face in GATE. From time to time I would keep posting more prep materials for GATE. So keep visiting me.